The new Facebook Timeline has gotten the attention of countless users from all over the world for various reasons. One the one hand, some people loved the new layout. On the other hand, some users dreaded having to switch to the new look without being given the option of retaining the old. There are, of course, those who simply couldn’t care less. Wherever you lie in the spectrum, it does not really matter if you want to continue using Facebook. Everyone will eventually get the Timeline. For what it’s worth, I am one of those who still have the old look. In the beginning, I really didn’t like the idea of having to switch. At this point, it does not really matter to me. What I am thinking is that one might as well take advantage of what the new layout has to offer. And when it comes to that, the cover photo is one of the things that you can play around with. I have seen many awesome cover photos, and while I am not all worked up about that, it is easy to see how one can play around with customization. Eye candy for the win! 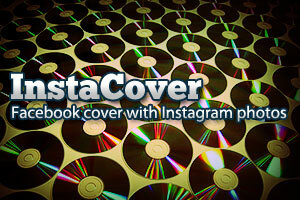 If it is customization and eye candy you are after, you can’t get much better than InstaCover. Since you are already going for full customization and eye-grabbing images anyway, why not go for something that will really stand out? What InstaCover does is to allow you to use a collage of Instagram photos as your Facebook cover photo. Forget boring one-scene cover photos. Why settle for that when you can have a barrage of images touched up with Instagram filters? The cool thing is that you do not even have to be an Instagram user to take advantage of InstaCover. Simply go to the InstaCover web site. You will then be prompted to log in via Facebook. No registration needed. No payment necessary. If you want to use your own collection of Instagram photos, you just need to enter your Instagram ID. Alternatively, you can opt to use other people’s photos by specifying tags and categories. Additionally, you can change layout designs, photo sizes, spacing, background colors, and even add text. After tweaking the various options, you can then preview your new Facebook cover photo to see if it suits you. In the blink of an eye – well, almost – you get to a unique cover photo that will bling up your Facebook Timeline.